The Agricultural Policies Monitoring Project works to influence agricultural policies and to encourage best practice for climate change adaptation to benefit farmers, especially those that are poor and vulnerable. It boosts awareness of climate change impacts on agriculture and the need for adaptation, and strengthens the capacity and skills of NGO network members. Read more here. 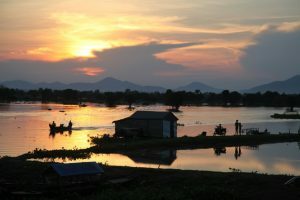 The Community Rights on Hydropower Development Project works in partnership with the Rivers Coalition in Cambodia (RCC) to influence government policies on hydropower dam projects. It encourages the implementation of ecologically sound, participatory, gender and climate change-responsive measures for dam-affected communities, including fair compensation. Read more here. The REDD+ Policy Monitoring Project works with CSO REDD+ in Cambodia. It focuses on REDD+ policy frameworks and practice to ensure the rights and interests of indigenous and forest-dependent people are protected. It promotes sustainable forest management, effective engagement and participation, equity in benefit sharing and transparency, Read more here. The Climate Change Policy Monitoring Project works through the NGO Environment and Climate Change Alliance (NECA) to promote awareness of climate change impacts and adaptation strategies. It strengthens the capacity and skills of NGOs to effectively advocate for best practice adaptations to be used to benefit poor and vulnerable communities. The project gives communities a voice to influence policy-makers to be more accountable. Read more here. The current focus of the Programme is the effective facilitation of advocacy efforts on climate change, hydropower and agricultural policies. Member organizations, network members and other stakeholders are supported to influence and monitor policies to benefit poor and vulnerable communities. All the projects consider climate change issues, and all are gender-sensitive, acknowledging the particular risks and challenges for women in these areas. international networks such as International Rivers, TERRA, Save the Mekong, Greenpeace, PANAP, CANSEA, Global Network of Civil Society Organisations for DRR, Asian Disaster Response Network and others. The Environment Programme had its beginnings in the Environment Working Group, established in 1995. Over time, the Environment Programme moved away from broad discussion to organized advocacy and facilitation of advocacy.